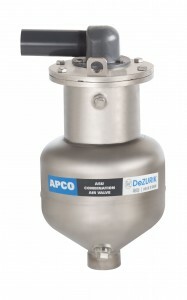 The APCO ASU Combination Air Valve introduces an innovative concept in air valve technology. Backed by years of field experience on tough applications, the ASU valve has demonstrated improved performance, reduced maintenance and lower cost for overall reliability on sewage and dirty service applications. The unique venting design provides varied and predictable air flow over a wide range of air release and air/vacuum conditions. A large diameter Air/Vacuum Disc provides high volume air flow for rapid venting during pipeline filling and allows high volumes of air to enter the pipeline during draining. During normal pipeline flow conditions, the dual-range air release design prevents air build up and resultant flow restrictions under changing conditions and through the full flow range.